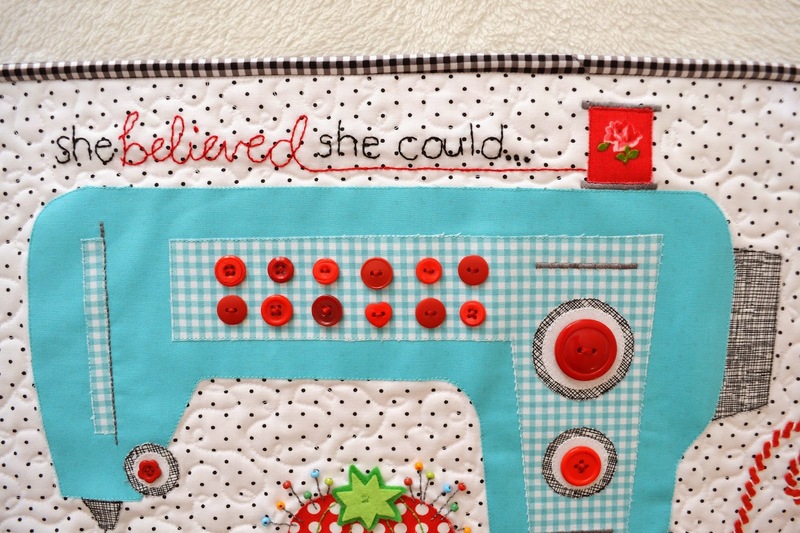 As promised here is the second entry for the Blogger's Quilt Festival over at Amy's Creative Side. 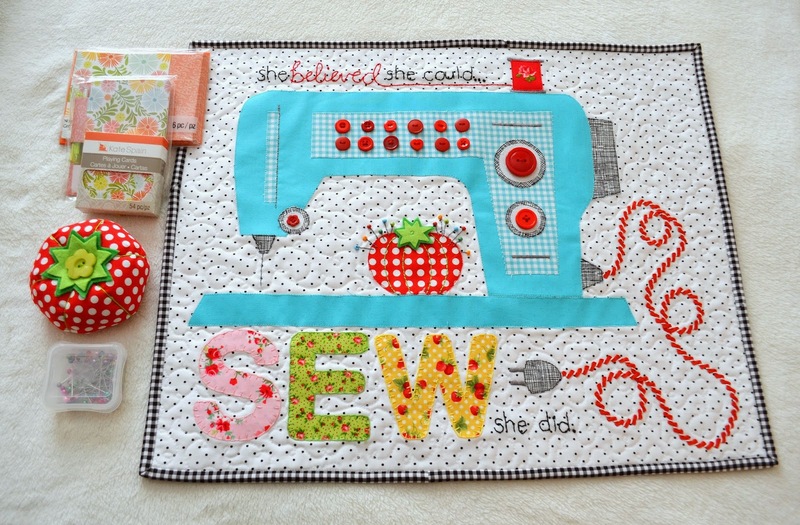 I recently took part in Doll Quilt Swap 14 over on Flickr. I love doing swaps! And I had a fabulous partner that I really wanted to do something fun for. 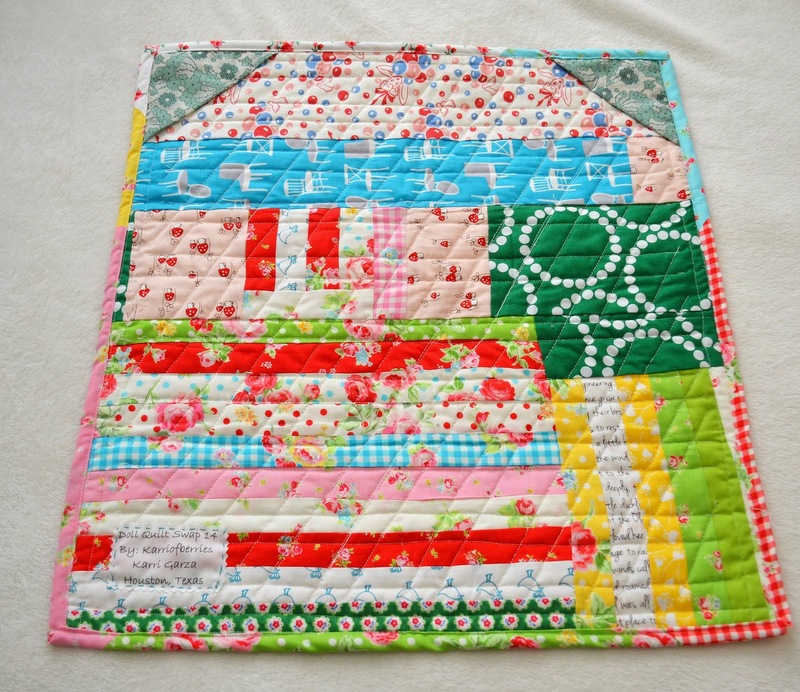 When I looked over her Flickr pictures I saw that she had a vintage aqua Holly Hobbie sewing machine and new this was the quilt I wanted to make for her! The pattern is from Lori Holt of Bee in my Bonnet. She was one of my favorite pattern and fabric designers. I love her style, and have you seen her adorable house!? I have had this pattern for while, so I was excited to finally have an excuse to use it. Lots of applique and some embroidery on this one. And of course, buttons! 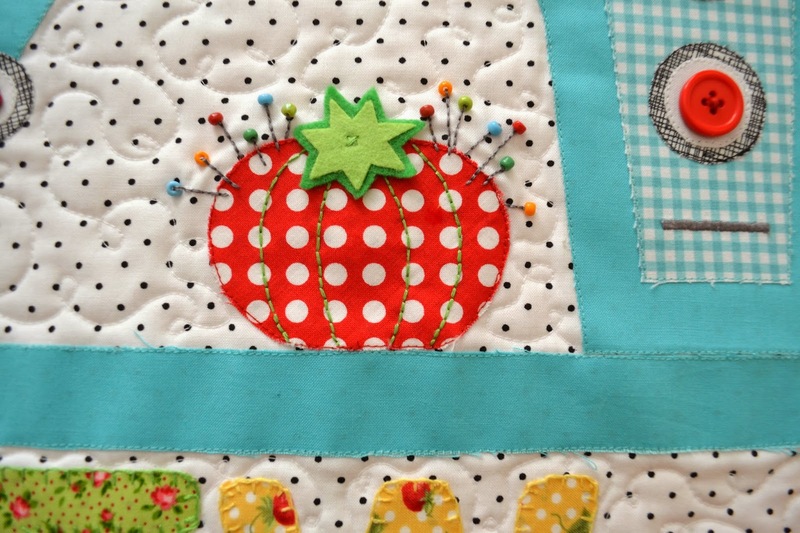 My favorite part is the tomato pin cushion. I love the little "pins" made with beads. I hand stitched the letters using a blanket stitch. I made the cord using red rick rick and then adding a white embroidery thread after each rick or is it rack? 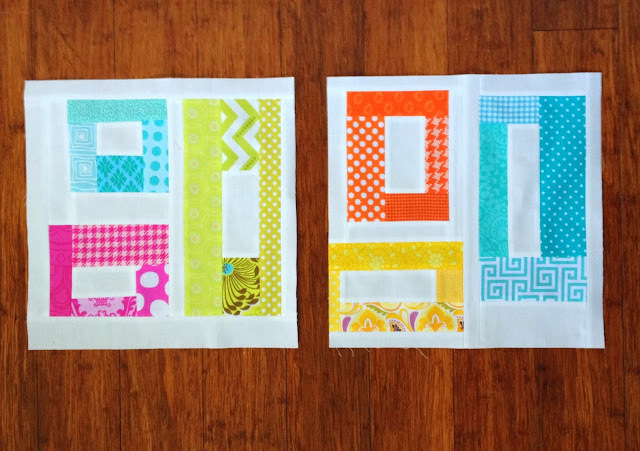 :) I also did some loopy loop quilting on the background fabric. On the back I used an adorable print from Pam Kitty Morning. Oh how I love my florals! ⌘Posted by Ellie Roberts at 10:09 AM 32 Leave a Comment! Hello friends! I have not checked in for a while, been so busy with kids, church stuff, etc. I have a little break today and I thought I share a few things. 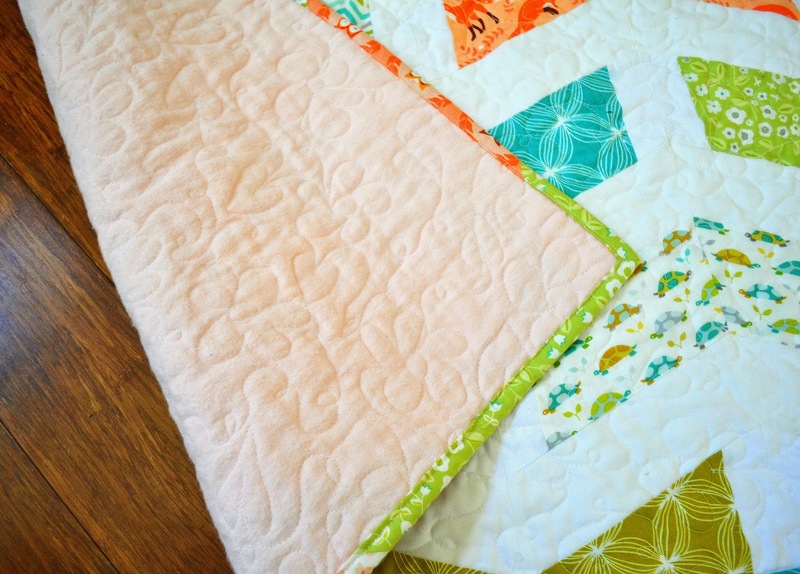 I have always love the Blogger's Quilt Festival from Amy's Creative Side. I honestly have been able to many quilts in the last year or two with all of our moves and losing my sewing space. 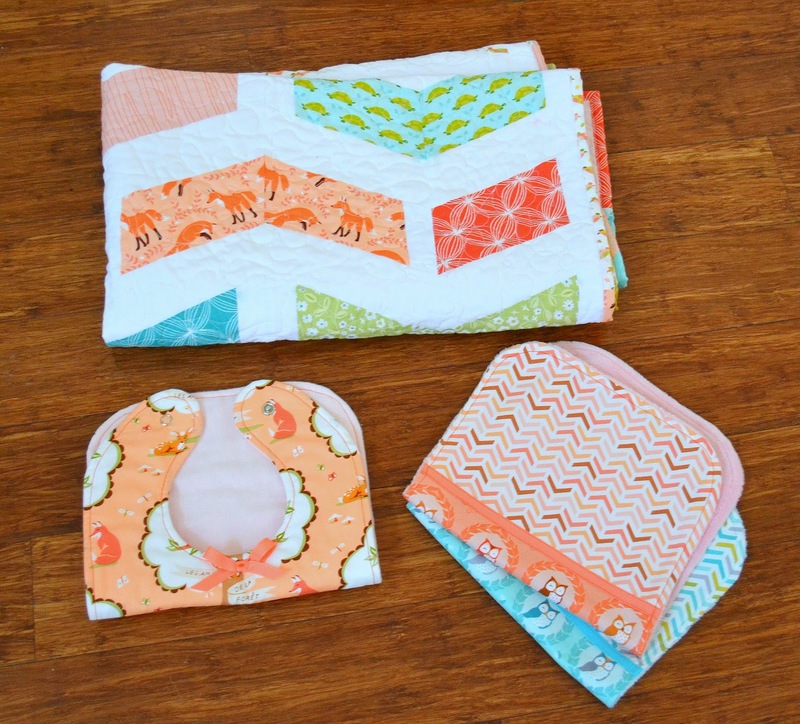 But I did make a baby quilt and I already shared my mini quilt with you. I thought I would enter those two quilts in the festival. But I need to make two different posts so forgive me! 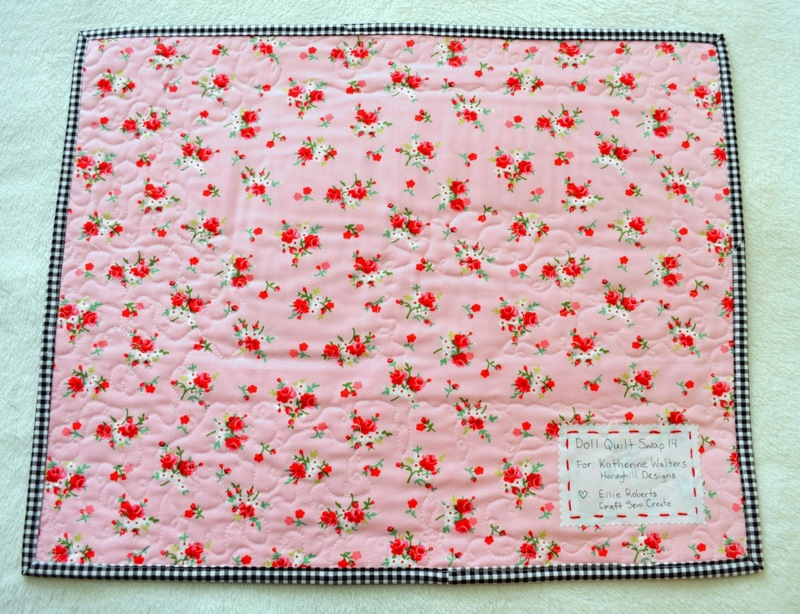 First up is my SMALL quilt, a baby quilt that I made for my precious new little niece, Aspen. She is her mommy's firstborn, so I wanted to make something special for her. 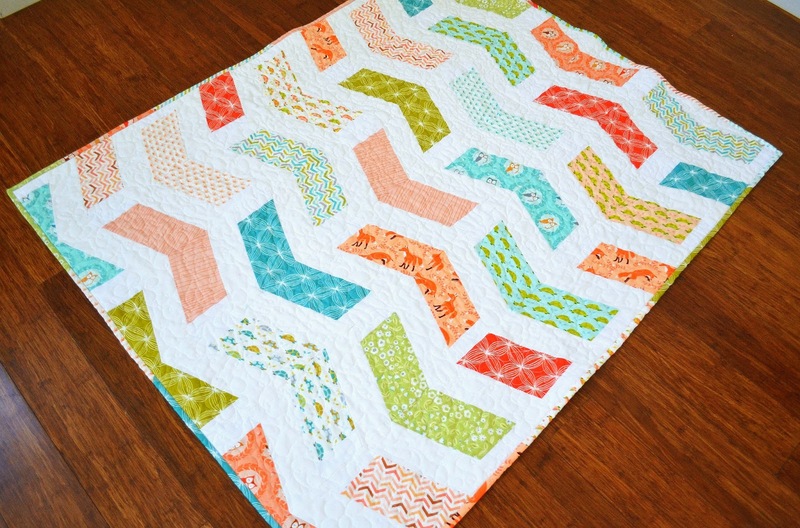 I knew I wanted to do a chevron quilt, but not the same one I had used before. 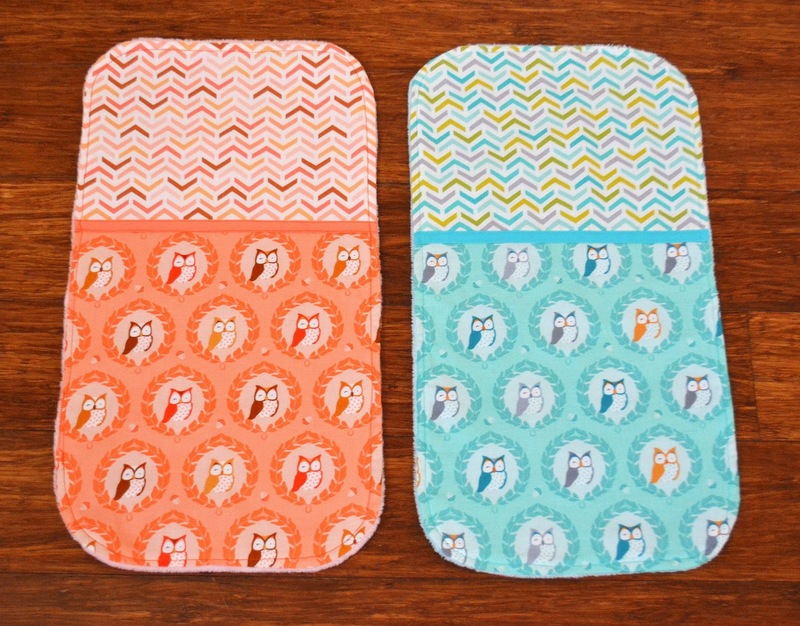 I this cool chevron pattern from the Etsy shop, SugarThreadz. Perfect. I'm really happy with the way it turned out. As always I love a white background to make those colors pop. I wanted the back to be nice and soft. I couldn't find the right shade of minky which I love to use. So I went the old-fashioned route and found a nice peach flannel. I think I'm converted. I love the way it looked and felt. I machine quilted it with flowers - a first for me! And heart shaped leaves with loopy loops in between. I was doing the flowers freehand and then I decided to draw some out just for placement beforehand. It went a lot quicker after that because I didn't have to stop and figure out where the next one should go. 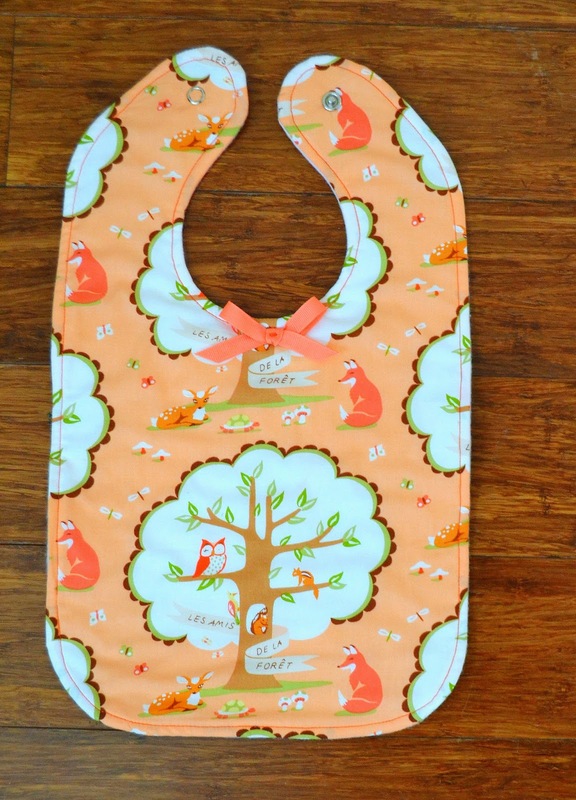 I also made a matching bib and a couple of burpies with the fabric I had left over. Together I think it made a nice set. 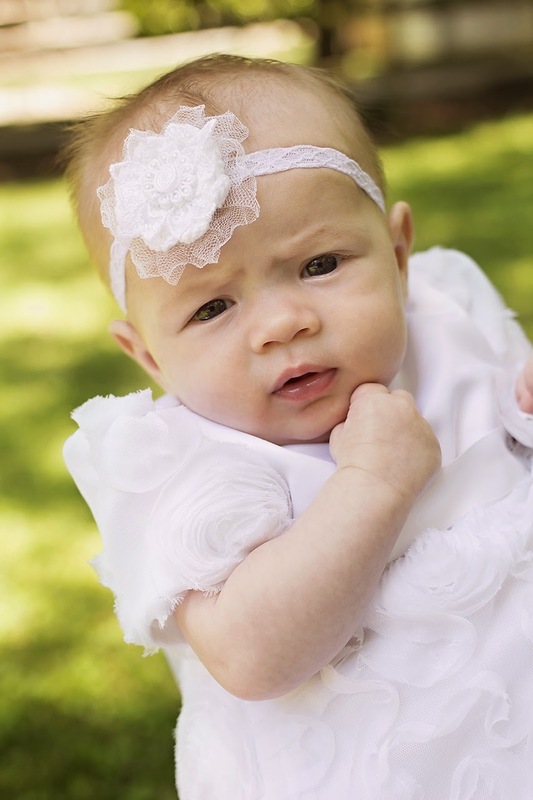 BTW, here is a picture of my adorable niece. I mean it just doesn't get any cuter than that! Thanks for stopping by, I hope you go visit all of the quilts in the Blogger's Quilt Festival. Don't forget to vote! ⌘Posted by Ellie Roberts at 9:54 AM 19 Leave a Comment! We've been working hard in the Faith Group of Do. good stitches! I haven't shared our blocks for the last few months and wanted to do an update of all our happenings. In December Anita had us try the wonky log cabin. I am the first to admit I really didn't love this block. First of all, I'm not a big fan of the whole wonky thing, second, it was just tricky and I don't really love how mine turned out. 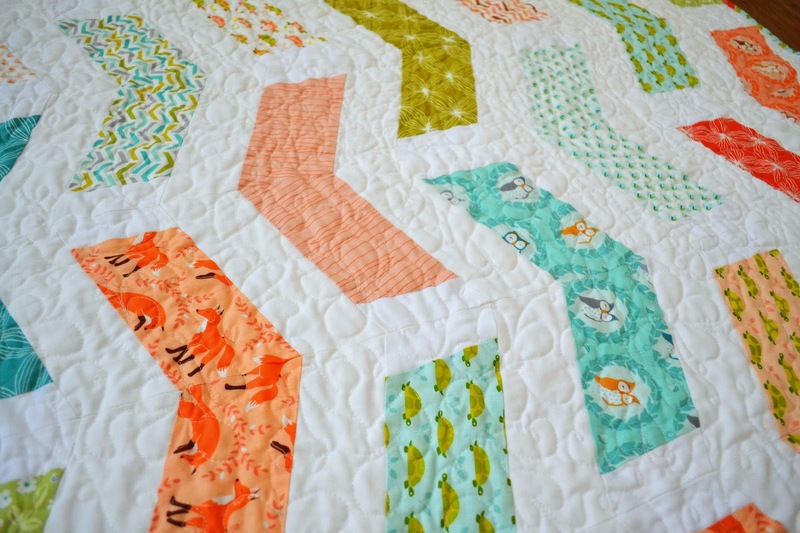 But I have to say the finished quilt does look pretty fun! For January we went wonky again! 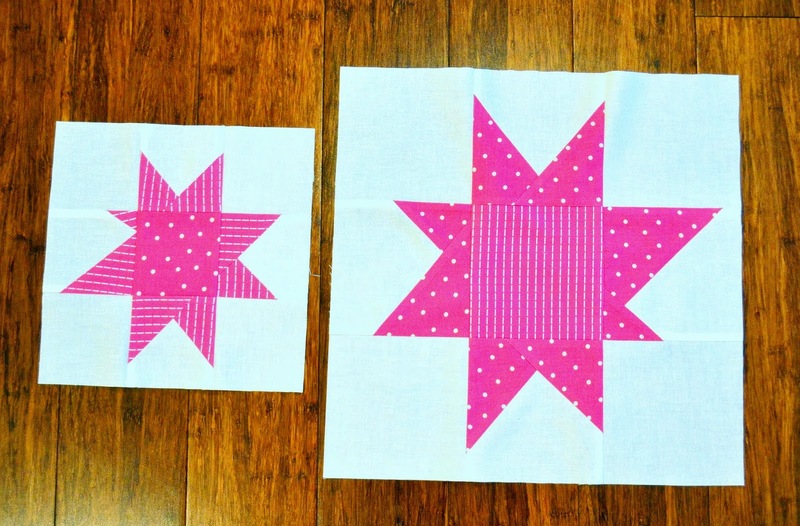 Melissa had us do a pair of wonky stars. We each chose a single color to do both a large and small star. 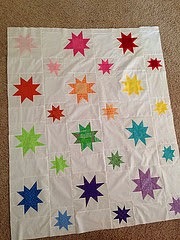 Then she took all our stars and put them in rainbow order, isn't it bright and cheery!? I know a recipient from Restore Innocence will just love it. 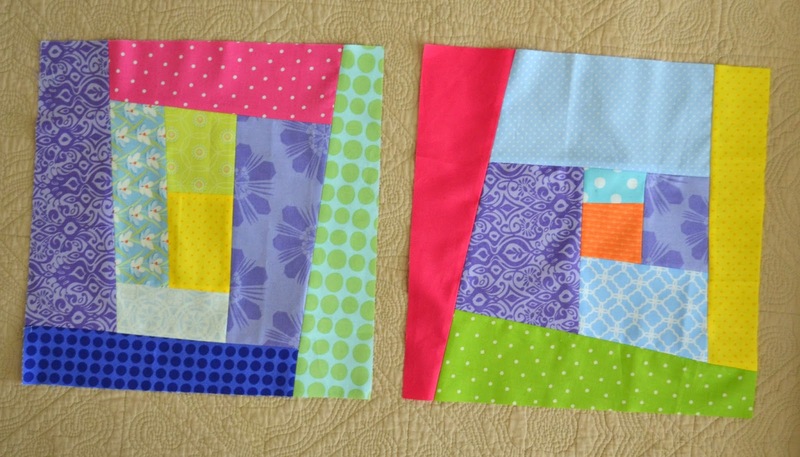 For February Debbie had us do the Vice-Versa block from GenXQuilters. I'll admit this was one of my favorites! I'm not a huge churn dash fan, but I love the way this looks with the mirror of itself. And I love the colors Debbie chose. ⌘Posted by Ellie Roberts at 10:34 AM 14 Leave a Comment! For my wonderful partner, Katherine of Honeyhill Designs, I decided to make a pattern that I've been dying to make for myself! It is from Lori Holt of Bee in My Bonnet and I first spotted it at a quilt shop in Utah when I was attending Sewing Summit. Katherine loves sweet vintage fabrics and owns a little aqua Holly Hobby sewing machine so I thought this would work perfectly for her. I just love all of the little details. This power cord is made from red rick rack embroidered with white thread. I used an iron-on adhesive for the applique and then machine stitched all the edges. 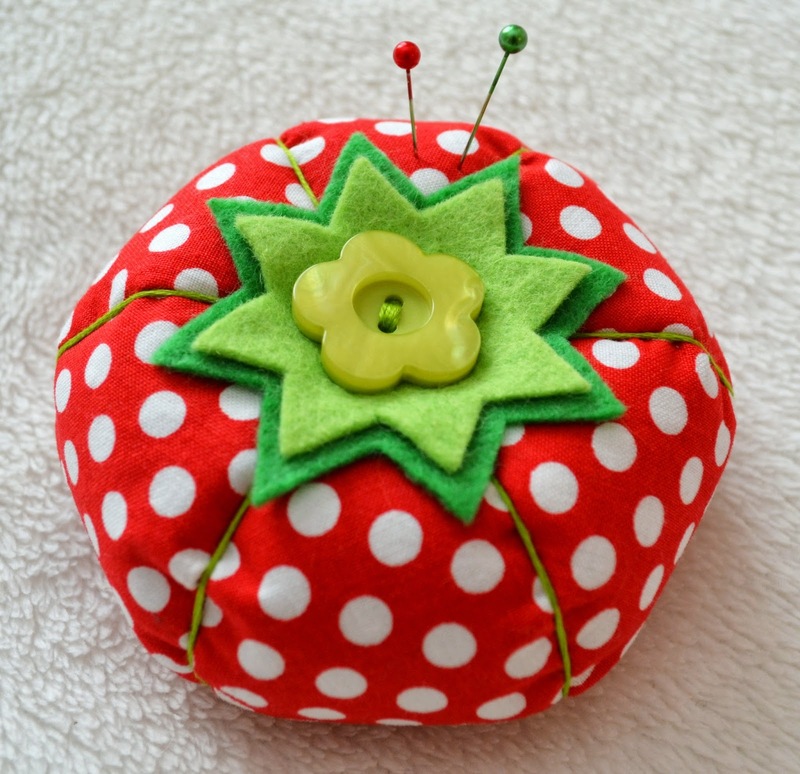 The little gray lines are satin-stitched and each of the pins in the pin cushion have little beads attached. 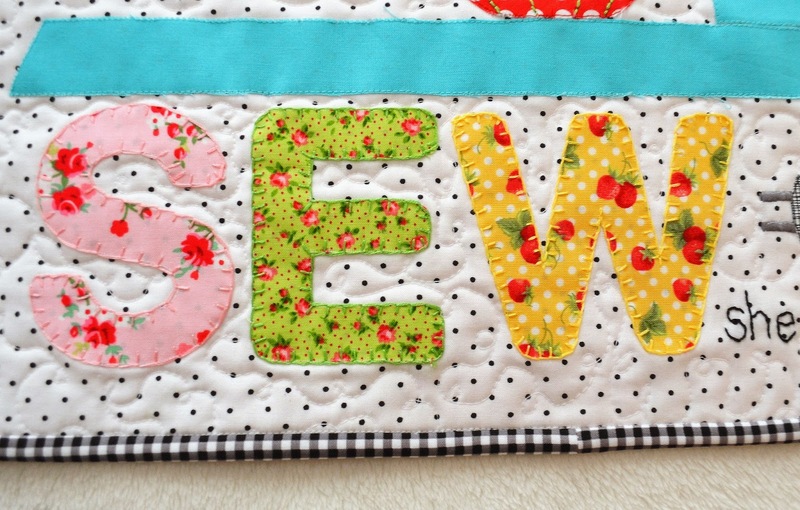 The small letters are embroidered and the large fabric SEW was hand-stitched with a blanket stitch. I also quilted it with a little loopy loop pattern.I'll admit it was more work than I thought it would be, but I love the way it turned out! For the back I used a sweet little floral from Pam Kitty Morning. Katherine said she was grooving on Red Pepper Quilts right now. Rita is using a lot of black and white with sweet vintage prints, so I decided to use the black and white dots and gingham. I like the way it frames the bright colors. 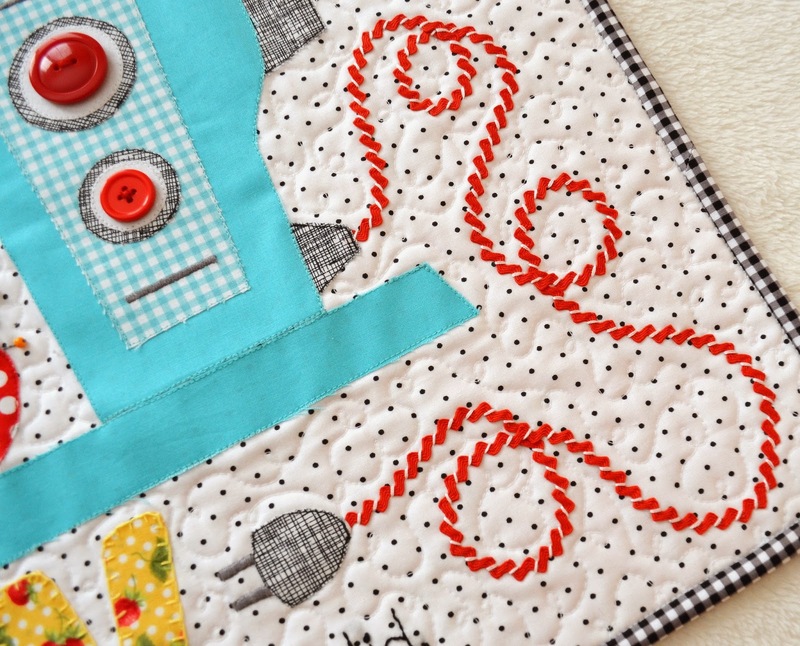 Here's a close-up of the little pinny. I hope Katherine will enjoy it all. I'll have to admit I'm ready to make one for myself! And now for the quilt that I received! Can I just say I literally gasped when I pulled it out of the package! Isn't it gorgeous!! It was made by Karri of Berries and she really took the time to make a quilt just for me. 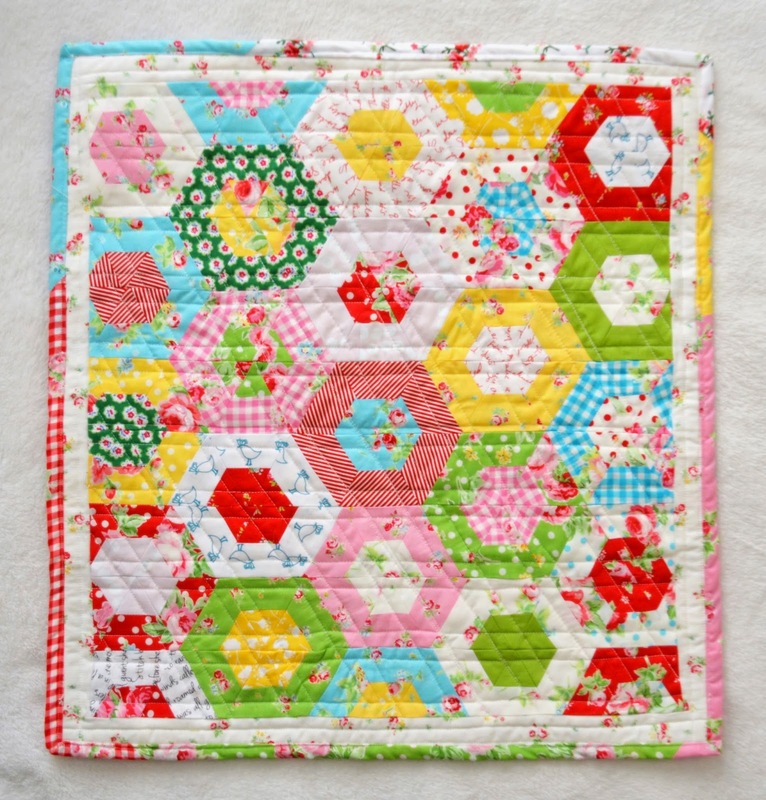 :) I love all of the fabrics she chose and the hexy pattern is awesome. Here is the beautiful pieced back. She even made hanging pockets! And here are the extra goodies she included. Yummy fabric, thread, fusible web, and little handmade metal labels. So spoiled! I just love getting this happy mail, it makes it all worth it! So another round down, I look forward to the next one. For now I am still working on my do. Good Stitches blocks and another round of the 4 x 5 Modern Bee. 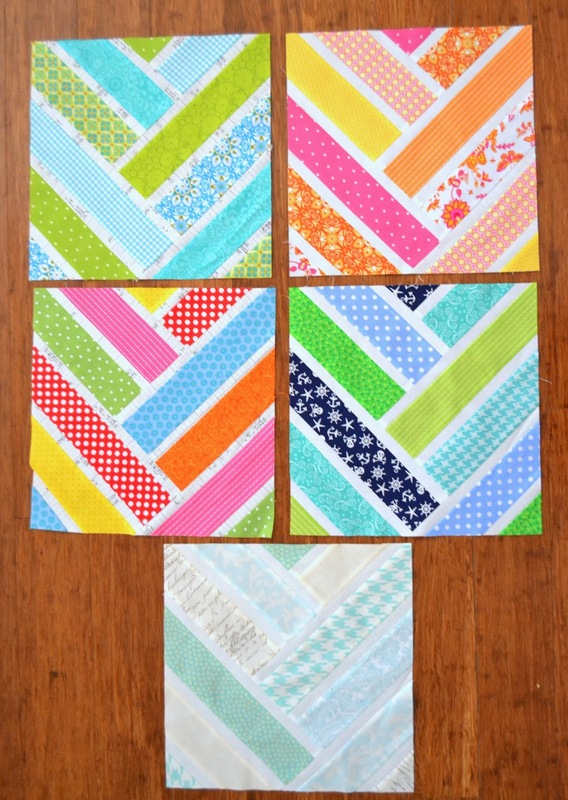 After the next round I should be able to make a quilt! ⌘Posted by Ellie Roberts at 1:08 PM 271 Leave a Comment! So on that note I'd like to share a couple of things I made to give for Christmas. My dear friend Jane that used to be my neighbor now lives all over the world! Her husband works for the government and they spent the last two years in Brazil and now live in Riga, Latvia! How cool is that? I'll have to admit the hubs and I are pretty jealous, we would love to be living and traveling all over the world. Jane has two beautiful daughters that were my daughters best friends. So we all miss each other to say the least! 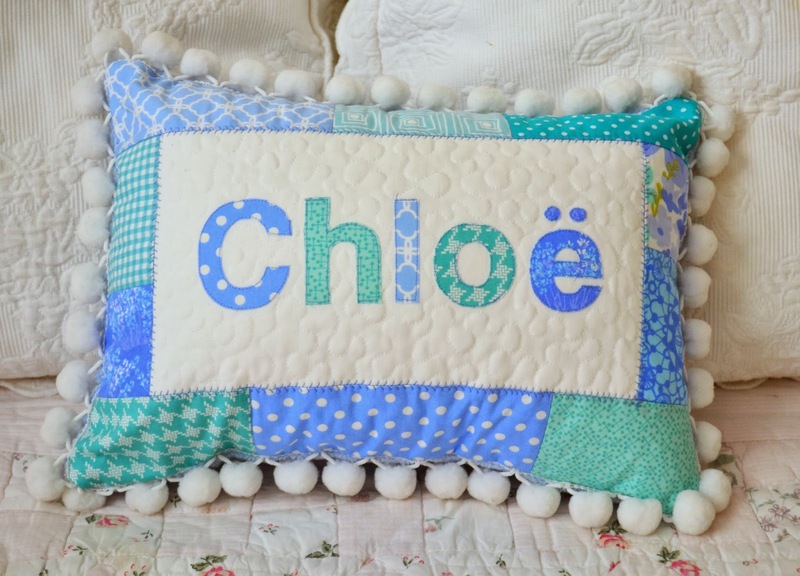 Awhile ago Jane had seen some name pillows that I had made and asked if I could make some for her daughters Chloe and Sophie-Claire. Of course! But of course I never got around to it. So this Christmas I was determined to make them and surprise them. 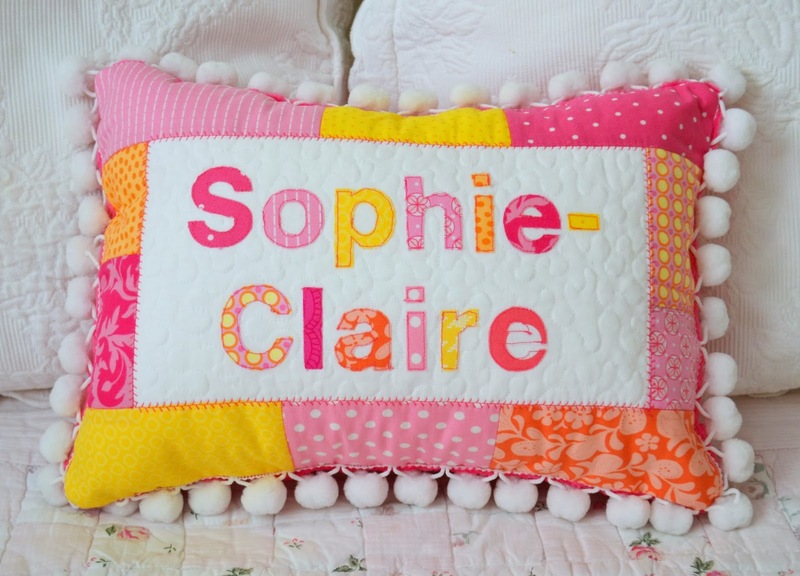 Chloe's favorite colors are cool colors and Sophie-Claire's are warm colors. That made it really easy and fun. Since they share a room they match but are unique! I did a fusible web to attache the letters and then straight-stitched around the edges. 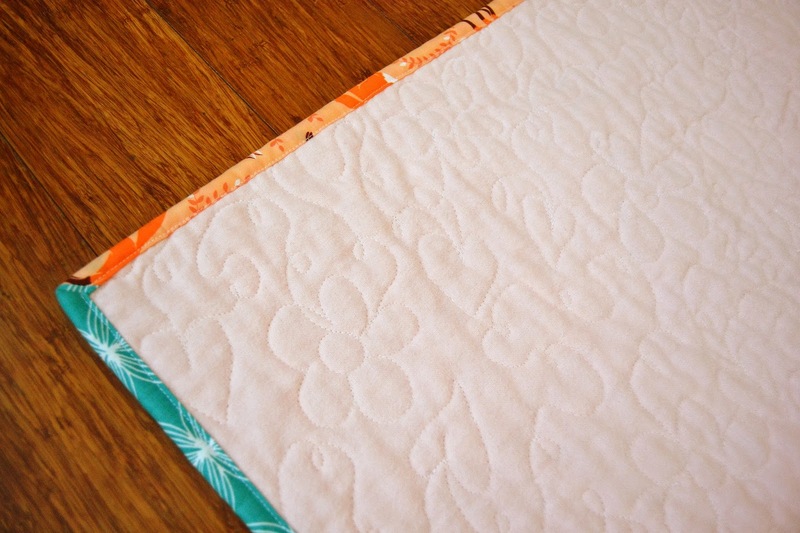 I stipple quilted the white fabric and did a feather stitch around the edge. 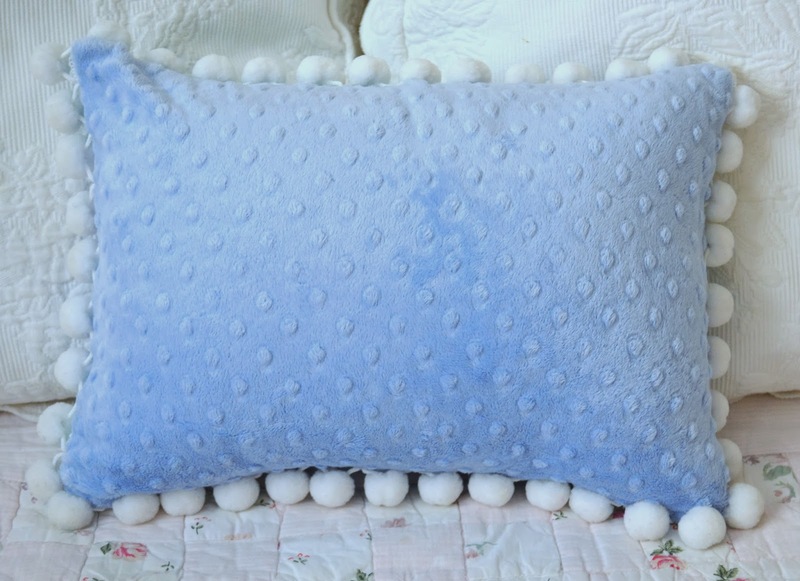 On the back I used a nice, soft, coordinating minky fabirc and did white pom-pom balls all around (Jane's fav:). 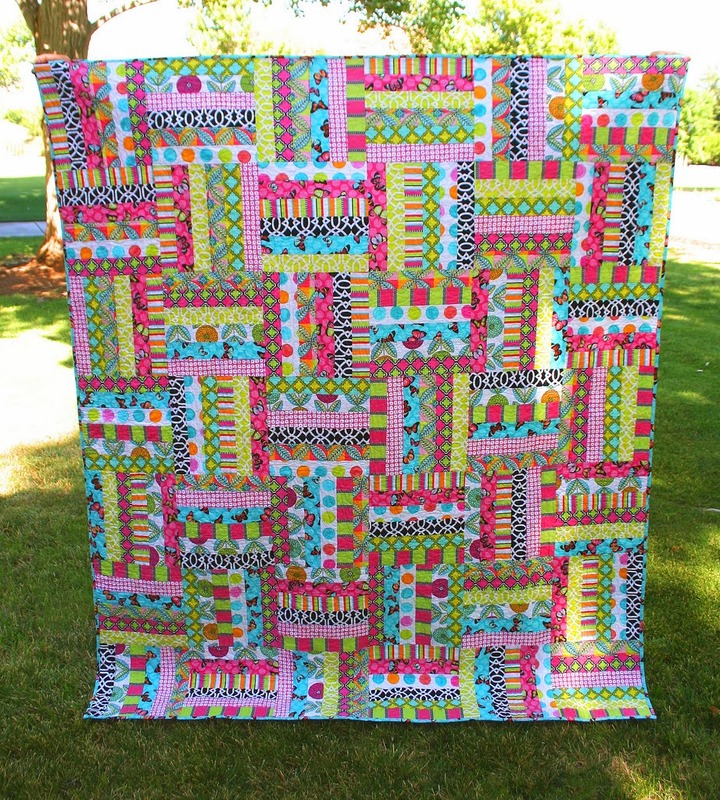 I also decided to send Jane my first quilt in years and years because the vibrancy and colors just reminded me of her and I wanted her to have something too. 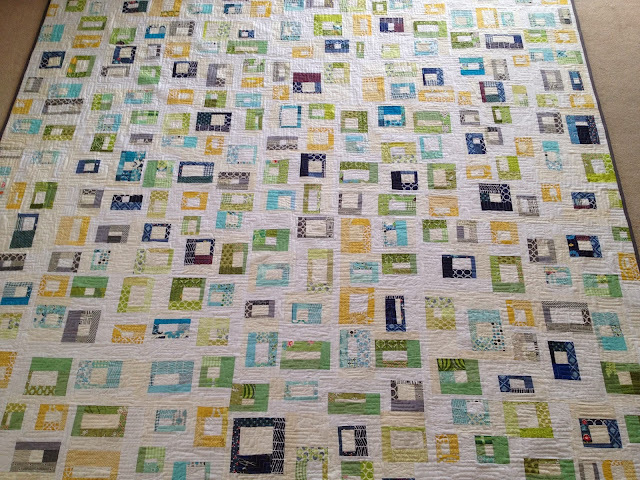 I also decided to send Jane the first quilt I had made in years and years, by Flight of Fancy quilt. The vibrant, happy colors just remind me of her and I wanted her to have something special to remember us too. 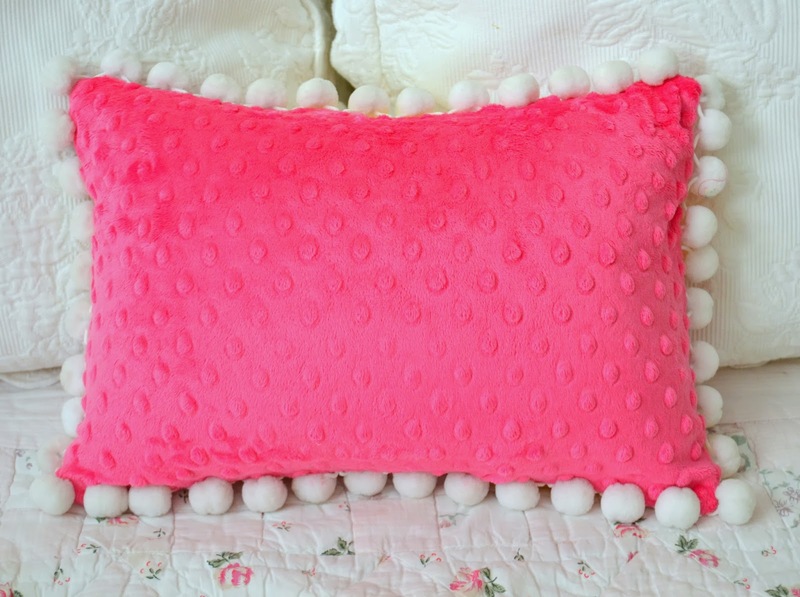 On a fun note, my Quilted Valentine's Pillow was featured on Sew Mama Sew today! Check my other fun Valentine tutorials and printables on my right side bar. ⌘Posted by Ellie Roberts at 8:02 PM 13 Leave a Comment! The holidays are upon us! It's amazing how fast they arrive. I wish I could just freeze time and make all my preparations first and then let it roll! But alas, here we go! 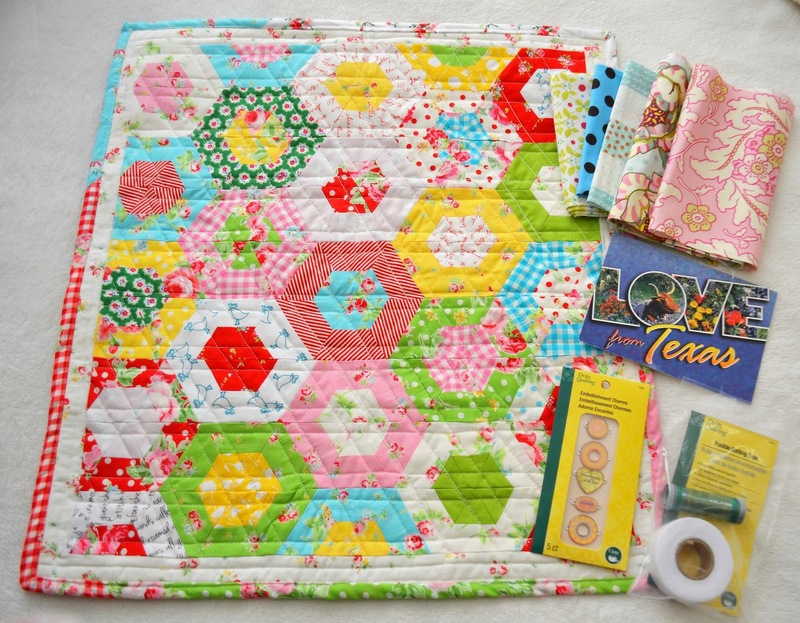 So first things first I had some sewing bee items I needed to cross off my list. 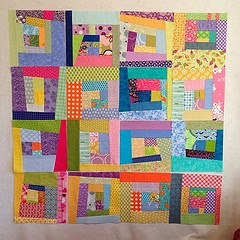 The top blocks are for my Faith Group of do. Good Stitches. It's been so fun to be a part of that group this year. And the founder, Rachel at Stitched in Color is having a fun celebration giveaway for group members to round off the year. Is it bad to say I hope I win? ;) The instructions for the Gemstone Block above can be found on Rachel's blog. 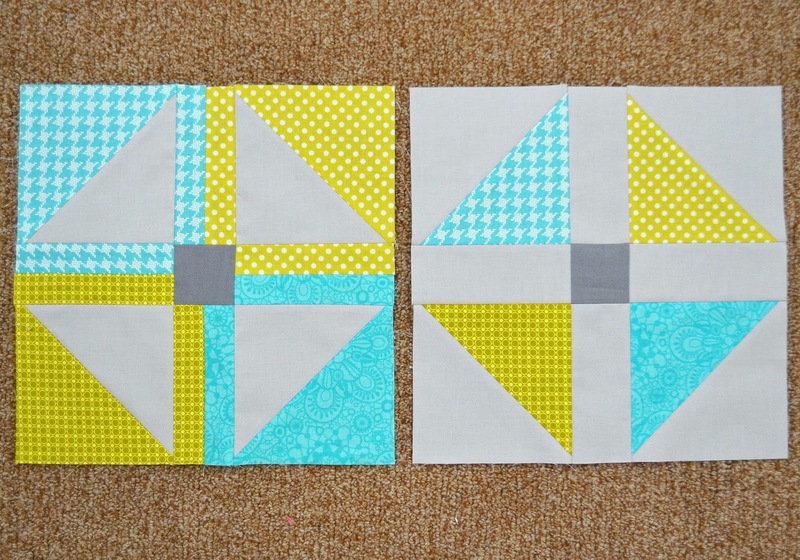 My second set of blocks is for the 4 x 5 Modern Block Bee. 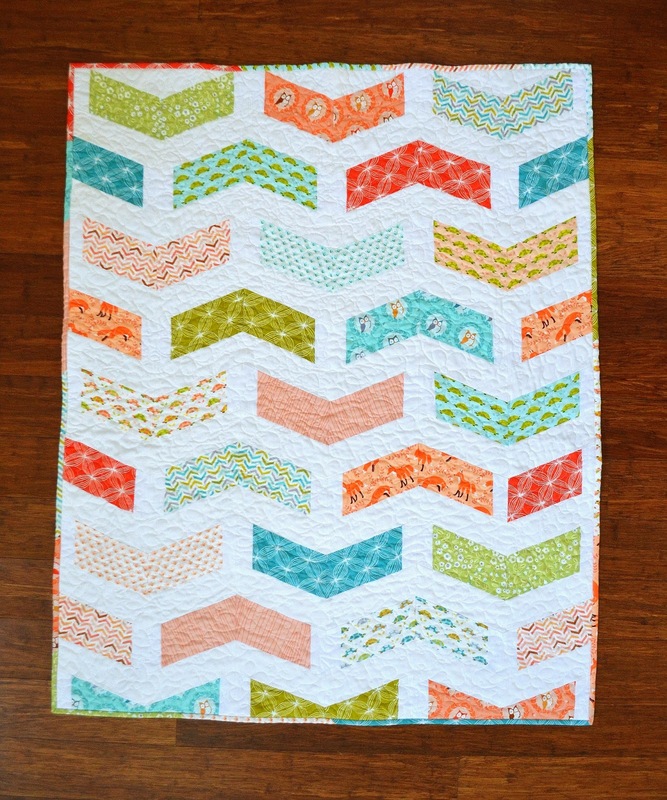 I decided to use the Broken Herringbone block pattern found at Play Crafts blog. I just loved the way it looked and it was a technique I hadn't used too much before- I'll call it Stitch and Slash! There is some waste involved, but I'm thinking totally worth it. I hope the ladies in the group like how they turned out. In this group, they pick the colors, you pick the pattern. I totally forgot to make one for myself! I'm using the same colors I chose last time, Aqua, Navy, Red and Yellow. 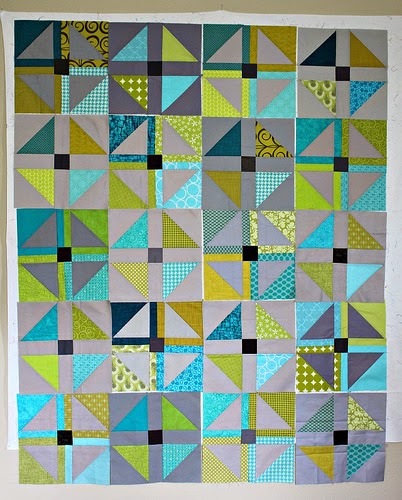 I hoping to have enough blocks to make a whole quilt someday. So two chores down, now I have to do some planning and figure out what I'll be making this season. But I'm hosting Thanksgiving next week and I'm filled with turkey terror! I've not been in charge of that for many years. Wish me luck! ⌘Posted by Ellie Roberts at 2:49 PM 4 Leave a Comment! 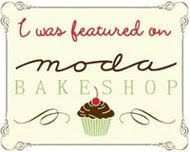 Hello blog readers (are you still there?) ! I've missed you! It's taken me a while to readjust to things after our move and not having all of my creative supplies at hand (they live in the garage now) has slowed down my creating a bit. 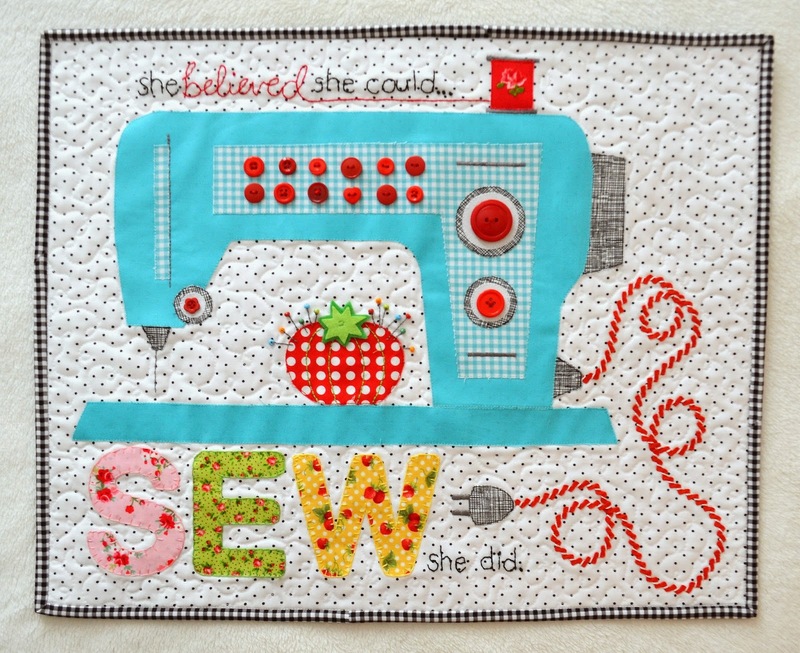 But I have been able to get back in a the sewing saddle for a few projects. 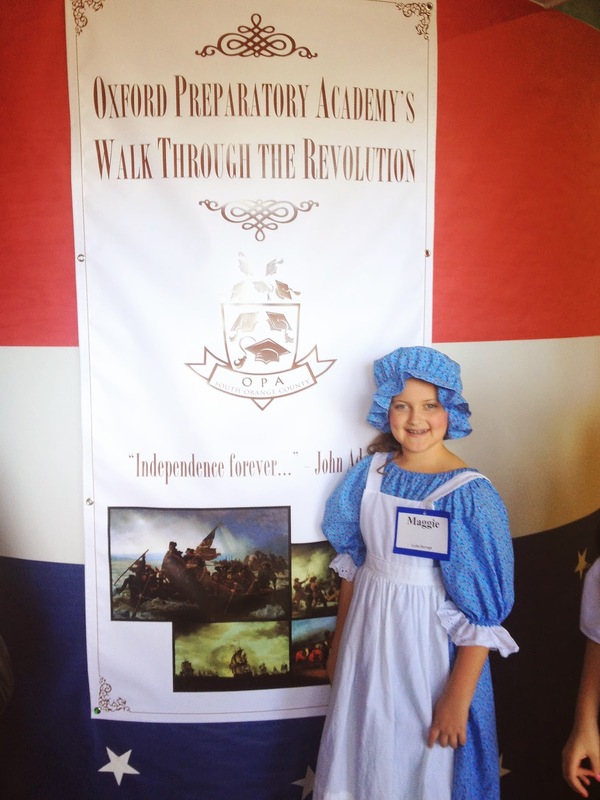 My daughter Maggie had a "Walk Through the Revolution" program at her school and needed a costume to wear to be a colonial girl. I found a simple pattern and a cute little blue floral print at Hobby Lobby. I actually had a two-fold purpose for this costume. Next year my other daughter, Sophie will go on a pioneer trek with our church youth. She needs pioneer clothes, so I wanted the dress to be able to be used for her too. So it's not overly "colonial" but I thought she looked pretty cute. I'll just make Sophie a pioneer bonnet and we'll be set! I love killing two birds with one stone, whoop! I also had a chance recently to catch up on bee blocks. Specifically the Faith Group blocks for Do. Good Stitches. I haven't signed up for any bees or swaps for a few months, but I couldn't drop my Faith group! They were very understanding and Debbie even made my blocks for me in August, awesome. The September "block" was actually a row quilt! So each of us did a row for the quilt. I chose to do a classic Lemoyne Star. Not hard to do, but visually appealing. Each person in the group chose a different row so I can't wait to see how they all look together. For October the block was more improvisational. I actually prefer to use a pattern with set measurements and I'm not a big fan of "wonky", but these were actually fun to make. 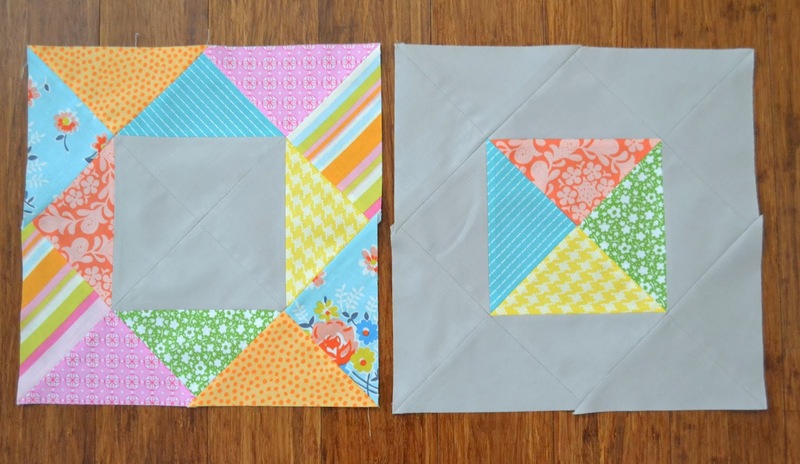 It's great to use up scraps and it actually wasn't too hard to figure out. Mine are not as wonky as some, but I think it will work. 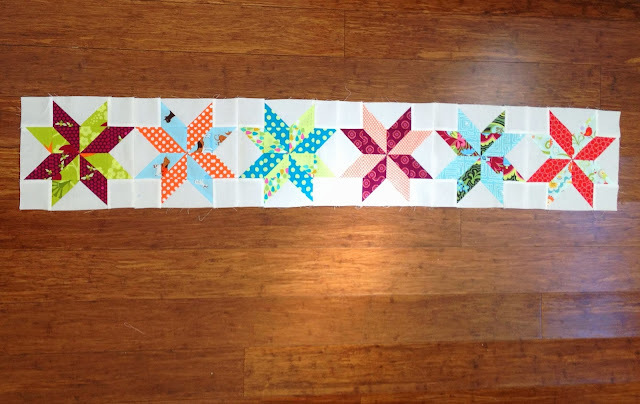 When the blocks are all put together the quilt will look something like this. Cool, right? It sure felt good to do some sewing again, so good that I recently signed up for two swaps, yikes! The Doll Quilt Swap 14 and 4 x 5 Quilting Bee that I have joined before. I hope I haven't bitten off more than I can chew, especially facing the holidays. But I think I can do it, it's good to be back! ⌘Posted by Ellie Roberts at 10:14 AM 5 Leave a Comment!